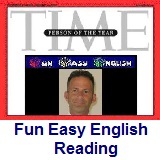 ﻿ Fun Easy English - reading practice and learning about the holiday Daylight Saving Time Ends. Daylight saving time (DST) is the local time adopted by many countries during summer. Typically, clocks are adjusted by moving the time forward by one hour in late winter or early spring. When DST ends in autumn, clocks are turned back to their normal time. DST was introduced in many countries to use the extra daylight available during summer. DST helps stores that sell to people after they get off work, but it hurts farmers and others whose hours are set by the sun. It cuts traffic accident rates. Sometimes it can reduce energy costs, but it can also increase them. The United States, Australia (not Queensland or Western Australia), the United Kingdom, Canada and many other countries have DST. In Europe, DST is called summer time. Iceland, Russia, Ukraine and Belarus are the few countries in Europe without DST. Daylight Saving Time has been a controversial topic for many years. Do you think countries should use Daylight Saving Time? Please post a comment below with your thoughts. 1. In late winter or early spring clocks are adjusted by moving which of the following? 2. In late winter or early spring clocks are adjusted by moving which of the following? 3. Daylight saving time helps which of the following? 4. Daylight saving time hurts which of the following? 5. Which country does not use daylight saving time?